Facebook To Post Amber Alerts To Help Find Missing Kids : The Two-Way The National Center for Missing and Exploited Children says social networking and sharing are essential in helping to find minors who may have been abducted. 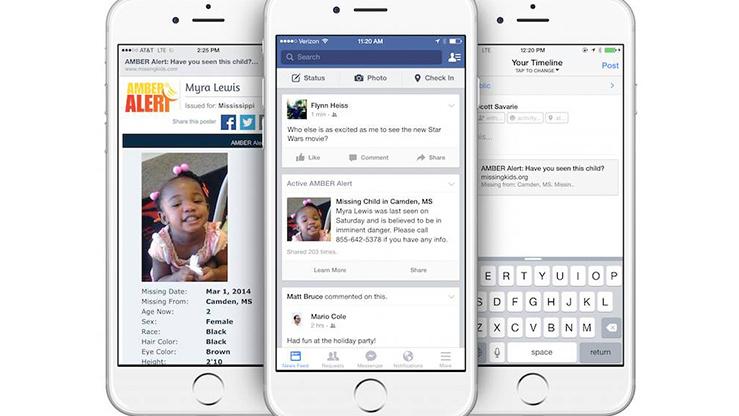 Starting today, the National Center for Missing and Exploited Children will begin sending out Amber Alerts on Facebook's news feed. The alerts will include a photograph of the missing child and the location where the possible abduction took place. "Amber" stands for "America's Missing: Broadcast Emergency Response." The alerts arose from the 1996 abduction and murder of Amber Hagerman, 9, in Arlington, Texas. So far, the alerts have helped save 728 children, according to the National Center for Missing and Exploited Children.